only a boy called David, but five little stones he took. 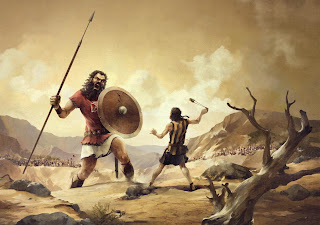 We've had one of those ‘ David and Goliath’ situations in our family recently. Having been brought up in Kenya, our grandson Cameron came back to England for ‘A’levels two years ago and hopes to go to ‘uni’ this autumn. But university is expensive and his missionary parents don’t get a salary. So he desperately wanted a holiday job this summer. 40 CV’s distributed and numerous phone calls made and still a job seemed as far away as ever. He was willing to do ANYTHING, from working in Next, to grave digging! I felt so burdened for him and prayed earnest ‘grandmotherly’ prayers for something … anything … that would lift the anxiety from his shoulders. One morning the whisper came as I prayed. ‘What about Richard?’ Richard is a builder and did the conversion on our house four years ago. He is also a Christian. He has a big job on this summer – a massive revamping of the inside of our church. Labourers are needed. Yesterday Cameron spent the day shifting bricks for Richard’s current project. He’s got the job! And not just any job.When his exams are over, he’ll be working with a team that shares his faith, and he’ll be helping to rebuild the church! And we will have the pleasure of his company for a couple of months – a rare and precious bonus for grandparents who have had to love this particular family of grandchildren from afar! He will build His church - we just have to go to him for the right ammunition. Excellent answer to your prayers. Thank you, Lord!